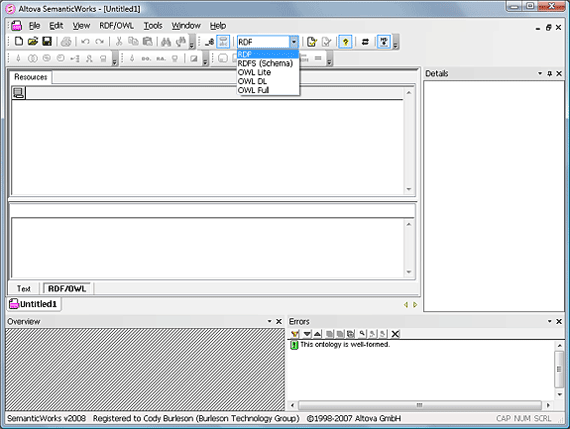 RDF is a common framework for describing resources. It is primarily intended to represent metadata that can be parsed and processed by machines rather than just displayed to people. While the resources it describes may be content or services that exist on the Web, they don't have to be; they can be real-world objects like you and I. Anything with identity can be described in RDF and, in this sense, RDF is a good candidate for recording and sharing knowledge on the Web. With RDF, we can model information by describing concepts in a way that is consistent enough for machines to process uniformly. At the same time, we are able to describe any concepts that exist and in all the different ways that we prefer to conceptualize them. In RDF, we do this in much the same way we would when describing something to another person: we make statements about the thing. In RDF, we make statements about things. "John Doe is a person." The thing the statement is about, so it is the subject. Identifies a property or characteristic of the subject, so it is the predicate. The value of the property identified by the predicate, so it is the object. A statement in RDF is called a triple. As shown above, it is common to represent a subject or object as an oval. The property is represented as an arc connecting to the value. The value, in this case, is a character string. Property values that are character strings or other data types such as integers and dates are typically represented by a rectangular shape; these are also known as literal values or literals. As shown below, it is also possible for the value of an object to be another object. A property that connects to a resource, rather than a literal value can be called an object property. RDF triples, create RDF graphs. 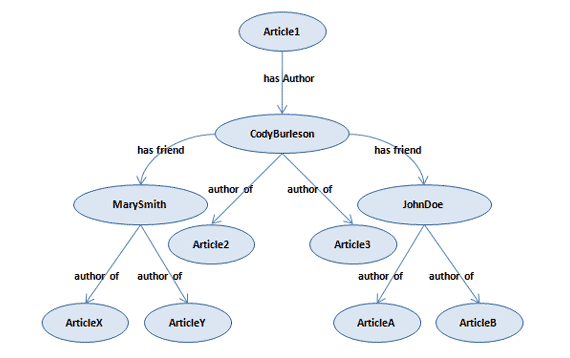 Now, graphically, we can begin to see how a collection of RDF statements creates an RDF graph. The model shown below gives us a sense of what RDF represents. 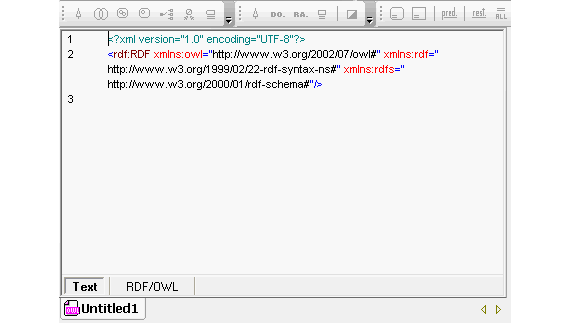 This representation could be written in RDF/XML as a single document or in several that are linked together. RDF graphs create a 'web of data'. Finally, when we link several resources together in RDF, we begin to achieve a web of data (or metadata, to be more precise). And that, my friends, is RDF in a nutshell. I've skipped a lot of detail that we may eventually cover, but for now, let us move on. Let's build something. For the remainder of this article, I will be giving a tour of Altova SemanticWorks, a visual RDF/OWL editor for creating Semantic Web applications (list price: $129). For this evaluation, I am using a tutorial that you can also find in the tool's help system (shown below). I will shorten the tutorial to the bare essentials and attempt to use it as framework for introducing additional concepts. Already this tool is providing valuable insight. As you can see from the RDF/OWL Level combo box, we are able to work with five different types of documents - each representing increasing levels of expressiveness. An RDF file is where we put statements about resources. The RDF file is where we will define individual instances of the information objects defined in our model. An RDF Schema file is where we define the information model that all of our individual instances will be based on. Additional document types are OWL Lite, OWL DL, and OWL Full - the three increasingly expressive flavors of the Web Ontology Language. The acronym should properly be WOL, but its inventors thought OWL just sounded better. I agree; WOL sounds like 'wall' (we don't need to be building any more of those in the Web). Today we will stick to plain ole RDF/RDFS and save OWL for extensive coverage in articles to come. Before we begin making RDF statements in this file, we need a model upon which the statements can be based. 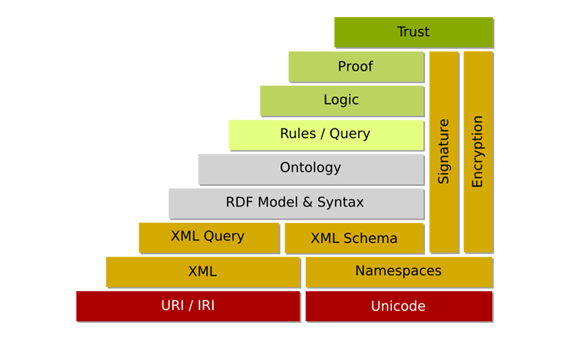 In Semantic Web terms, a model is typically called an ontology. An ontology is a formal specification of a conceptualization. It defines objects that exist in some domain (of knowledge), the properties they can have, and the relationships that exist among them. If you are used to content management concepts, you could think of an ontology as defining one or many content templates and the RDF as defining the instances created from those templates. Or, if you are accustomed to object oriented programming, you can think of the ontology as defining the classes and properties and the RDF as defining the instances. It is important to understand what is happening in the dialog above because it is common to many Semantic Web tools. At left, you are specifying a namespace URI, but since URIs do not necessarily resolve to an actual file, you must map the identifier to a file resource. If you have been following along since the beginning of this series, you may recall that URIs are identifiers; they are not necessarily locators. There is no guarantee that an actual file resource can be retrieved by pasting a URI in a browser, so sometimes we need to specify a mapping between the URIs and local file resources. 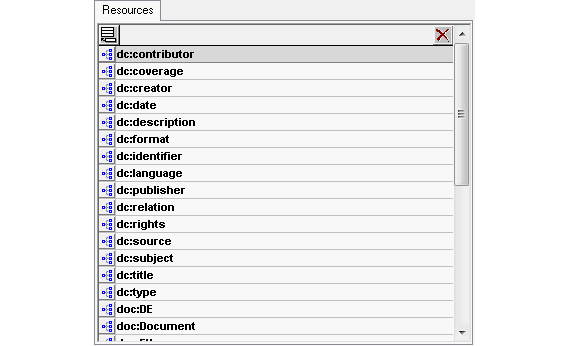 That creates a new element is the resources view where you can enter a name for the resource using a namespace prefix and a unique name for the new resource. For example: "doc:IntroToSemanticWeb". My First-use Review of Altova SemanticWorks? If you are already familiar with Altova products like XMLSpy, then this could be a good tool for you. However, if you are new to RDF or Semantic Web concepts, you might think twice before cutting your teeth on this one. 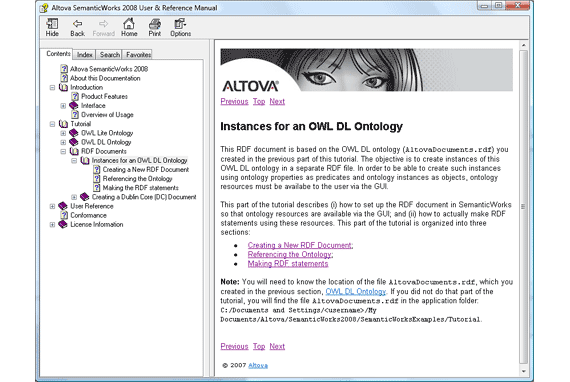 This is a visual RDF/OWL editor that gives the familiar XMLSpy visual metaphors and the powerful source view capabilities that Altova is known for. But don't expect to be hand-held; even the help files will not teach you much about Semantic Web concepts. This tool expects you to know what you are doing. I cut my own teeth on Protégé, a free, open-source ontology editor and knowledge-base framework. It is a great alternative that we will also explore in an upcoming article. The price of Altova SemanticWorks is not bad, however, so I will be trying it out more soon. Personally, I like to have a lot of toys in my tool-box; it seems that each does something better than the other and so I use a number of tools to get the benefits from each. This article has provided a high-level overview of the Resource Description Framework and a quick summary of just one tool you can use to author RDF documents. 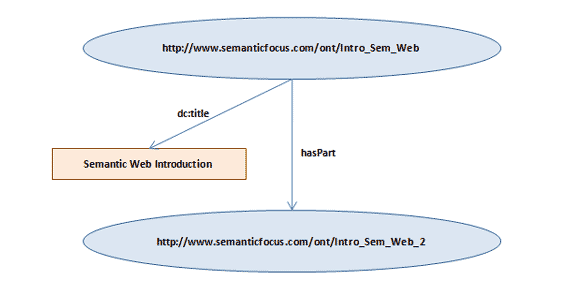 In next week's article, we will begin to move into the next layer of the Semantic Web architecture with a discussion about Ontology and OWL. I will also show you how to create a nifty little Semantic Web application using Protégé. Until then, enjoy your work and enjoy the Web.